This session allowed me to practice capturing and visualizing the processes used by a team. 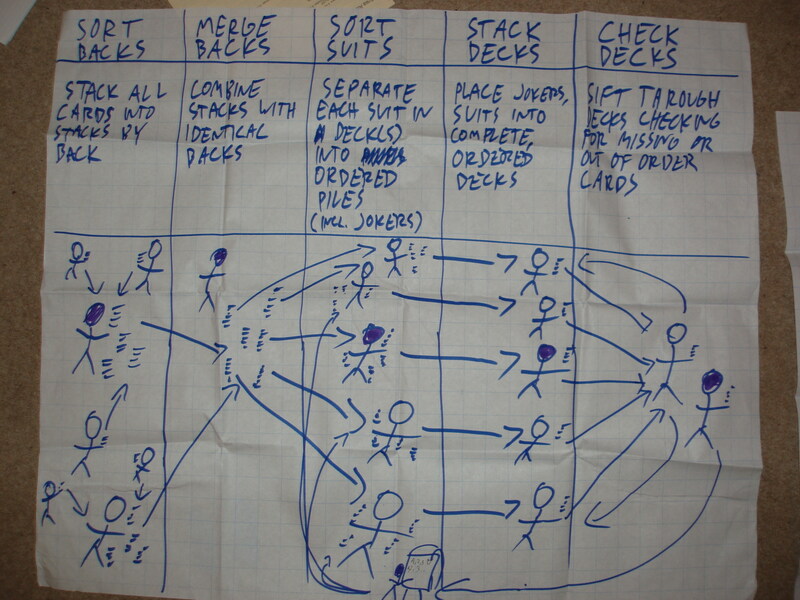 In order to create a process to work with, we first conducted a simulation, where we (about 15 participants) organized ourselves to produce a product (sorted decks of cards) from raw materials (many cards from different decks). Volunteers took on the roles of the customer, the customer’s QA manager, the factory owner and the factory production manager, while the rest of us (myself included) acted as factory workers. As a manager in my day job, I wanted to get a different perspective in this exercise, and practice different kinds of leadership. While the customer and management were sequestered for further instruction, the workers waited outside and talked about what would happen. There was quite a bit of talk of disrupting the activity, making things difficult for management, which I hoped wouldn’t amount to anything once we got started. The point of the exercise was to learn something, and being too disruptive would hinder that. More interestingly, several of the workers had participated in other, similar simulations, and so were keen to avoid the obvious pitfalls. We collectively resolved to work cooperatively and treat each other well during the simulation: to act as a team. This turned out to be a defining moment in the simulation. The appointed manager started out by briefing us on the parameters of the simulation, insofar as he was aware of them, and setting some ground rules. He explained that there was a mess inside, preparing us for what to expect. Realizing the group might be too big for the task at hand, he explained that some people might not be needed, and they should find something to do on their own without interfering with the rest of the group. This was also a key action. The manager also made a point of wielding explicit power, which I found a bit excessive. He said there would be layoffs, and threatened that as punishment for the workers. Particularly given the team dynamic, this threatened to unite the team against him, which I felt was an unnecessary risk. When we were ready to start work, the manager gave a lot of explicit instruction, providing an algorithm for the first phase of sorting. It wasn’t a very good algorithm, and this was evident to some members of the group, but the workers didn’t seem to feel it was worth the time which would be wasted arguing. That is, all but one, who caused the group to block for a couple of minutes by refusing to cooperate or suggest an alternative. What was missing at this point was an understanding of the goal. The team was prepared to work on the task, but without knowing what the result was expected to be, they hesitated and were confused. The manager offered a vote on a small change to the algorithm, and it was agreed. Gradually, we established that the result should be piles of cards sorted according to the pattern on the back, and the team quickly self-organized around this goal, largely disregarding the proposed algorithms. This beautifully illustrated one of the lessons of the exercise, by showing how quickly and naturally processes diverge from what is prescribed. I took quite an active role in learning the parameters of the simulation and helping to facilitate the group’s self-organization. During the initial card-sorting phase, I established a clearinghouse for cards of all types, and invited my colleagues to bring me any type of card to add to my stacks. This simple act made it obvious how to contribute to the goal, and organized the physical materials for later use. Someone else was doing the same thing, and when all of the cards were stacked, we just combined our stacks. The manager explained that we needed to sort the decks. I asked what ordering should be used, and he pointed to a flipchart where instructions were written. The workers took the stacks of cards off to various parts of the room to sort them. Once I had one complete, I took it to the QA manager, who said it was incorrect. I checked it against the instructions, and it was clear that they were not effective in communicating the correct ordering. I rewrote them on another flipchart, checked them with the QA manager, and took the old instructions down. Before I went back to sorting cards, I talked to other people sorting, and made sure that they knew about the new instructions. I checked if they had any complete decks, helped them do the final (quick) sorting by suit, and carried their completed decks to QA. This simple action which both boosted our immediate output (by pushing work in progress through the process) and accelerated production (by spreading information about the requirements). The next time I handed in a batch of cards to QA, I was recruited to work at the QA table, because there was a shortage of capacity there. After checking a couple of decks, I had had experience with every stage of the process in the “factory” and thus a strong working knowledge of the overall process. For the rest of the time, I sought out work in progress on the factory floor and helped to finish it off. Wherever I found stacks of cards, I just sorted them and took them to QA. Throughout this process, I remember hearing the disconcerted voice of the owner, who seemed to be worried about everything. She was frightened when I fixed the instructions on the flipchart, confused when I was changing roles or anything else unexpected. She noticed when people were not working, and wanted the manager to do something about it. I’m not sure how that role was structured, and what pressures she was responding to. I had no contact at all with the customer. Once the simulation was over, the customer checked several of the delivered products, rejecting one which had an error, but still ending up with enough to meet the requirements. All told, the simulation ran very smoothly, and I was keen to analyze why. Next, each of us drew a diagram of the process from our point of view. I often struggle with creating diagrams by hand, because I tend to work out the structure as I go. This time, I stopped for a moment and sketched the major phases of the process in my notebook before I started drawing. This resulted in a much clearer and neater diagram than I normally produce. We discussed the diagrams as a group, which revealed a lot about how things had really worked, more than anyone had been able to see individually. It was surprising how much information was disseminated in such a short amount of time through drawing and discussing the diagrams. It helped that the entire exercise was very fresh in our minds, but I got the impression that this would be a useful way to gather and share information from a group under normal circumstances as well. I had to leave a bit early in order to catch my flight, so I missed the end of the discussion. I finally got around to unloading my camera, and have uploaded a photo of my process diagram.